He Modi has already been conferred with Saudi Arabia’s highest civilian honour – the King Abdulaziz Sash. Prime Minister Narendra Modi has been conferred with Order of St Andrew, Russia’s highest state honour, on Friday. 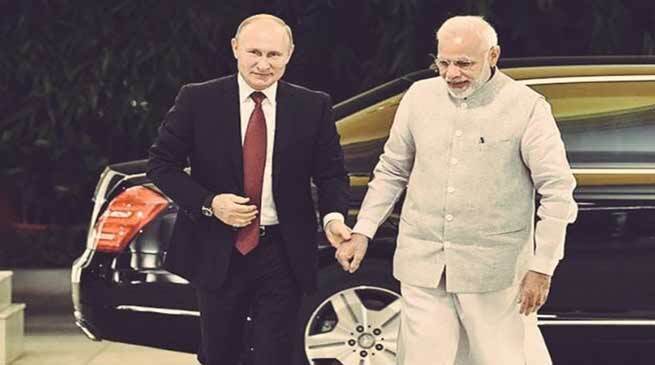 He was decorated with the award for his exceptional services in promoting special and privileged strategic partnership between Russian and India. PM Modi was also awarded the United Arab Emirates’ highest civilian award, the Order of Zayed, earlier this month for boosting bilateral relations between the two countries. He has already been conferred with Saudi Arabia’s highest civilian honour – the King Abdulaziz Sash. The Order of St. Andrew was established as the first and highest order of chivalry of the Russian Empire in 1698. The award was abolished under the USSR before being re-established as the top Russian order in 1998. The award ceremony is usually held at the St Andrew Hall of the Grand Kremlin Palace.